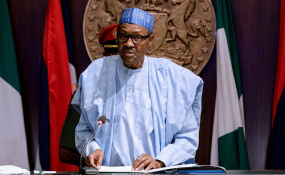 President Muhammadu Buhari will leave Abuja on Monday for an official visit to Britain, the presidency said in a statement Sunday evening by presidential spokesperson, Garba Shehu. Mr Shehu said the president is due to "hold discussions on Nigeria - British relations with Prime Minister Theresa May, prior to the Commonwealth Heads of Government Meetings scheduled for April 18 to 20." "The president will also meet the Chief Executive Officer of Royal Dutch Plc, Mr. Ben van Beurden in connection with Shell and other partners' plan to invest $15 billion in Nigeria's oil industry. These investment ventures will lay the foundation for the next 20 years production and domestic gas supply, bringing with it all the attendant benefits both to the economy and the wider society." The spokesperson added that Mr Buhari is due to "renew discussions with the Archbishop of Canterbury, Justin Welby, a good friend of the president, on inter-religious harmony in Nigeria and worldwide. "Further meetings have also been scheduled for the president to see some prominent British and Nigerians residing in Britain." Mr Shehu did not indicate if Mr Buhari will see his doctors in London, where he spent several months last year receiving treatment for an undisclosed ailment.